Aviation Updates Philippines - AirAsia's Taylor Swift-painted Airbus A320-200 is expected to arrive later in the Ninoy Aquino International Airport for the Red Tour to be held at the Mall of Asia Arena on June 6, 8 PM. 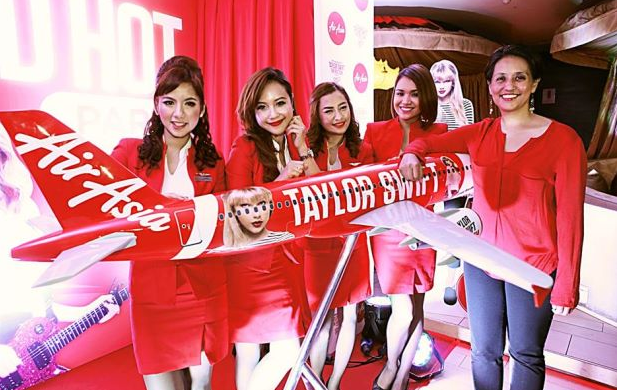 Last Friday, AirAsia, the official airline of the Red Tour, unveiled the Taylor Swift-liveried plane to be used in the Red Tour. Aireen Omar, CEO of AirAsia Berhad, expressed the happiness over the opportunity to work with one of the most popular international singers as it marked yet another milestone for the AirAsia Berhad. "We are very excited because she's a very popular international star and for her to be associated with AirAsia is an extremely fortunate event for us," Omar told The STAR in an event where they unveiled the design of the plane. "It is truly an honor for us to have her and to be able to fly her and her group in her tour around Southeast Asia. She represents the youth and like the brand, she reaches out to the masses as well. It's something that we feel it’s similar to who we are." she added. "I don't think she's demanding. She has been very accommodating and casual about things and we are very fortunate for her to agree to use this as her official airline. We are the biggest local carrier in Asia and Southeast Asia is really our backyard for AirAsia so I think it makes sense for her to collaborate with us and fly her everywhere and make sure she’ll be able to meet her fans," Omar said. Meanwhile, a sold out Taylor Swift Concert (part of the Red Tour) was cancelled in Bangkok due to recent events in Thailand. Ticket holders are able to refund their tickets for this special event at all ThaiTicketMajor branches during normal business hours from May 29th, 2014 at 1000 hrs. until June 30th, 2014. AirAsia will continue to use its Taylor Swift-liveried plane for a long time, "Oh, yes definitely because she's very relevant to the world right now and I think a lot of people reach out and can relate to her… we will have it for a long time," Omar said. On the other hand, AirAsia's Airbus A320 will be traveling to Jakarta, Singapore and Kuala Lumpur for the show. At the MOA Arena, Taylor Swift is expected to sing its famous songs just like 22, I Knew You Were Trouble and We Are Never Ever Getting Back Together.